Way back in November, I posted this pic & asked where it was. There were a couple of guesses, but none got it right. These water fountains are located in the front hall of our middle school - right across from Mrs. Allen's 8th grade English class & next to the boys bathroom. Below are a few more pics from our middle school, taken in October 2008 by Kathy Flynt. I've also tried to find an older picture of the same area for comparison. Here is the front hall of the middle school, looking north. If you went out the double doors way down at the end of this hall, you'd be heading towards the gym. You can see the set of water fountains on the right. The open door in the foreground is most likely Mrs. Rhoden's old room. I only have one memory of this room: spitwads. The main hall. 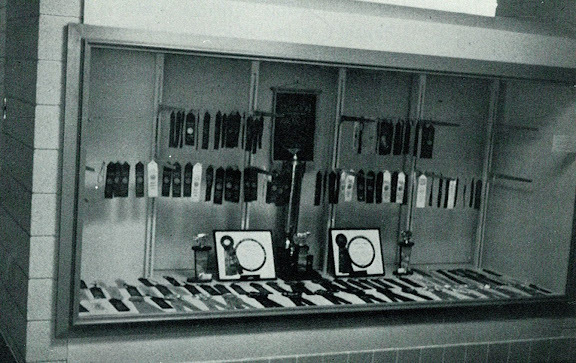 Who had lockers in this hall? The retro-odd-shaped windows on the right look into the library. You can see the Alltel dude guarding the Library door and asking for old cell phones for recycling. Crazy... we didn't have cell phones in middle school. We didn't have cell phones in HIGH SCHOOL! Heck - recycling wasn't even invented yet, was it? Below is the same trophy case next to the library entrance (above). 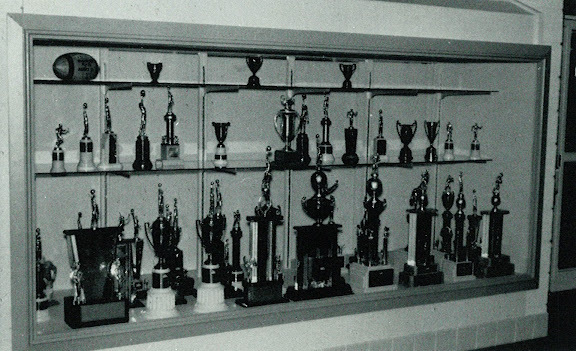 I can't remember what we put in the trophy case during our four years in middle school, but FORTY years ago, some of our parents displayed championship trophies for their high school sports teams. 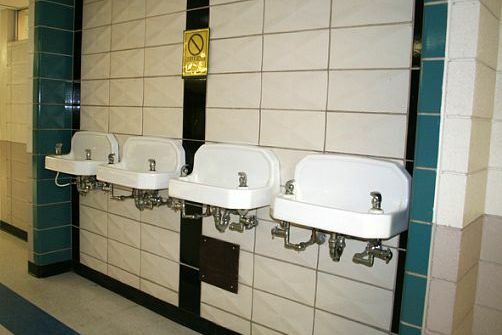 Above was our 5th grade hall bathrooms - you remember? They were between the end of the 5th grade hall and the cafeteria. 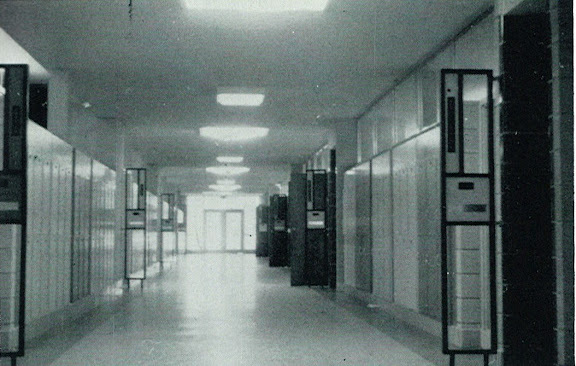 This photo is looking back down the fifth grade hall (Mr. Hope's class on the left & Mrs. Rash across the hall). I don't know about the girls, but could I get some guy to back me on this one: this boys bathroom was the grossest thing I've ever seen in my life. This place was so nasty, you dared not even breathe the air. And the walls - covered with snot hockers, green, yellow, slimy snot hockers. This place would rival any outdoor Citgo Station restroom in Jefferson County. 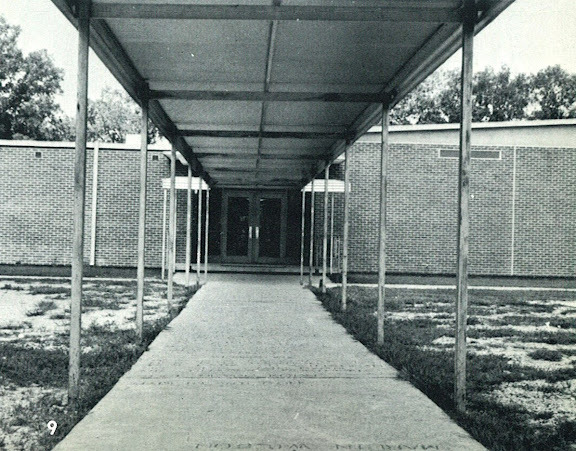 Here's a view of the sidewalk turning 90 degrees from the previous photo, taken in the 60's. Notice the area on either side hasn't been black-topped yet. It's where we hung out before school in the AM and then during our lunch recess. It's where we gathered in clicks. It's where we swarmed in sadistic frenzies watching fist fights. It's where we played four square against the Tompkins. And lost. It's where I saw a pair of Nike's for the first time ever. It's where we paired up on those white curbs and tried to pull our opponent off without losing our balance. It's where several of us weaker ones got "pantsed." It's where Jamey Black "two'd" Andy Mayberry. It's where we passed origami-like folded notes with the fateful question "WILL YOU GO WITH ME?" I wonder what kind of memories are being made on the blacktop today? I wonder if they realize it?